The state of Nebraska has county, state, and federal facilities that all fall under state jurisdiction for staffing and maintenance. Currently, there are 2 federal correctional facilities such as the United States Penitentiary at McCreary, and 10 state penitentiaries such as Lincoln Correctional Center, Nebraska Correctional Center for Women, and the Nebraska State Penitentiary, as well as numerous county jails. The Department of Corrections' current staff are sworn to create and maintain an atmosphere of firm guidance, integrity, and empathy with incarcerated persons; this mandate lowers rates of recidivism and eases community transitions while ensuring safety throughout the state. The state currently employs 5026 officers and with the modest growth in the field, predictions for new jobs created by 2022 are expected to exceed 250 (BLS.gov). Alongside vacancies created by retirement, attrition, and advancement of senior personnel positions, the field of corrections will continue to be a pivotal player in the state's economy. Want more information about this lucrative and challenging role? Read on! Peru State College ranks first in our latest rankings with thirty-eight students completing programs in criminal justice out of a total 934 students in the 2012-2013 school year. University of Nebraska at Omaha ranks second in our rankings with 209 students graduating from programs in criminal justice out of a total six thousand students from the 2012-2013 school year. Midland University ranks third in our latest rankings with sixteen students completing programs in criminal justice out of a total 478 graduates. 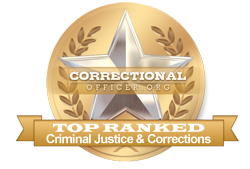 Wayne State College ranks 4th in our latest rankings with forty-eight students graduating from programs in criminal justice out of a total 1,458 graduates from the 2012-2013 school year. Western Nebraska Community College ranks 5th in our rankings with 19 students completing programs in criminal justice out of a total 702 students in the 2012-2013 school year. Recruits who have successfully passed all requirements and screenings up to this point will be placed in a hiring pool and enrolled in new hire training. Training at this stage focuses on practical tactics for the job, as well as policies and procedures that are applicable to the role. Personnel that have completed this last phase of the hiring process will be posted to job vacancies as the need arises. One of the ways that the state of Nebraska strives to serve and support correctional officers is through strong job growth and salary opportunities. Currently, the median income for front-line correctional officers throughout the state is higher at $53,000 than that of the national median income of $39,800. According to the occupational profile for the state of Nebraska found at http://www.careerinfonet.org/occ_rep.asp?next=occ_rep&Level=&optstatus=011000000&jobfam=33&id=1&nodeid=2&soccode=333012&menuMode=&stfips=31&x=44&y=10 published by CareerInfoNet.org, state and national trends predict a 4% and 5% increase in correctional officer jobs by 2022 respectively. For residents of Nebraska this rate translates into 70 job openings per year. The table below lists career information collected by the Bureau of Labor Statistics for correctional officers in Nebraska. The table is sorted by total employment, with the largest metropolitan areas listed first.